Finer grind setting is not so standard for espresso or Turkish but more appropriate for French press or drip brewing. Attractive outline, lots of precious features and very low cost price will give this DBM-8 grinder a great value. 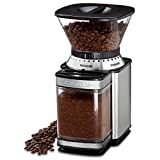 From the price point and considering all features with excellent grind for drip coffee or French press for loads of you and your coffee loving friends, it would be much better product for you. Cuisinart dbm-8 cleanup is easy as the hopper, chmber and burrs are removable. This stainless steel finish elegant burr grinder has some other options need to know in details. I will step by step delineate you the most important features of Cuisinart DBM-8. Cuisinart dbm-8 discharge the maximum flavour with sweet aroma in each grind option whether you prefer French press or other coffee brews. Just turn the hopper in your right setting, select the amount of cup and touch the start button and it automatically grind beans and shuts off. What you will find is that your cool coffee full of best flavour. Let me know if this cuisinart dbm 8 review is useful. Join us to explore more ideas.